9. THE AMEN: Revelation 3:14 (NIV) says “To the angel of the church in Laodicea write: These are the words of the Amen, the faithful and true witness, the ruler of God’s creation. 10. FAITHFUL WITNESS: Revelation 3:14 (NIV) says “To the angel of the church in Laodicea write: These are the words of the Amen, the faithful and true witness, the ruler of God’s creation. 11. TRUE WITNESS: Revelation 3:14 (NIV) says “To the angel of the church in Laodicea write: These are the words of the Amen, the faithful and true witness, the ruler of God’s creation. 23. KING OF KINGS: Revelation 19:16 (NIV) says “On his robe and on his thigh he has this name written: king of kings and lord of lords. 24. LORD OF LORDS: Revelation 19:16 (NIV) says “On his robe and on his thigh he has this name written: king of kings and lord of lords. 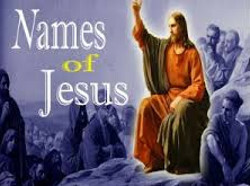 Jesus is called many other names. These are just a few. His name is above all names. What a mighty God we serve - Aren't you glad for His Plan Of Redemption!